In 1987, Kraft Mac 'n' Cheese was pretty much a family staple. My kids were always finicky eaters and this was one thing they (aged 2 and 3 at the time) would eat. Today, it's one of the few things my daughter can cook and she probably eats at least a box a week. The first picture is from eBay. Somebody is selling 7 complete boxes for about $10 (plus $14 in shipping!). I didn't remember that the boxes had two cards on them. I've still have the Wally Joyner card pictured on the bottom box in the photo. Notice that his hat is airbrushed to remove the logo. This is a common practice on cards like this. Kraft had a contract with the MLB players union, but not with major league baseball. So they could use the picture of the player but not the team logo. The card is a bit smaller than a regular card and is blank on the backside. 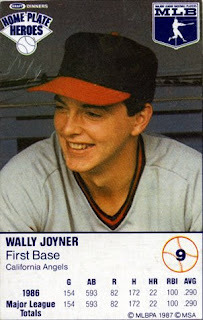 At the time, Joyner was a player I collected. About two years ago I was looking through the binders of cards I had and dropped some players. Joyner, I'm afraid, has been relegated back to the commons boxes to make room for some more deserving player. There is another auction featuring just the double set of cards cut from the boxes. The other player on the box with Joyner is Johnny Ray but apparently, the matchups are random. In the other auction, Ray is paired with Harold Baines. The eBay seller recommends that whoever buys the boxes doesn't eat the contents. Sounds like it would be worse than eating the gum from an unopened pack of 1987 Topps. After reading Steve's last two posts I thought, well, I've got a card cut from a cardboard food box and I've got another card I've altered. I decided to go with the altered card first. In a recent trade with Andy, I received from him a bunch of Phillies cards. 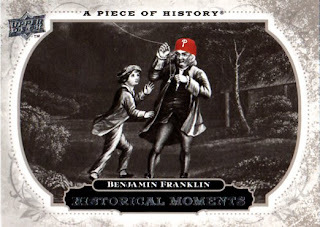 In the pack was this Ben Franklin A Piece of History Card. I decided to keep him with my Phillies cards since he is, after all, one of the most famous Philadelphians. And I decided to give him a Phillies cap as well. Isn't Photoshop wonderful? 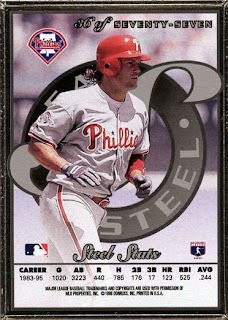 The hardest part of this was finding an already scanned Phillies card which had a hat facing in the right direction. Sometimes I long for the days when baseball cards would come on packaging, not just in it. Many years ago, when a product advertised a free baseball card with every purchase, the cards would actually be part of the box. To get these cards, you would actually have to take a pair of scissors (or something equally sharp) and cut out the card from the box. For this reason, these cards don't always look the greatest. It's also this reason, that these sets are easier to collect. Some persnickety collectors will not put their grubby little hands on anything that is not mint. These cereal cards are heaped into piles and largely forgotten. Sometimes, you can find bulk lots of these cards on eBay and other auction sites. If the cards have seen better days, you can find fantastic deals. The 1962 Post set is fairly easy to collect. There are 200 different cards and eight variations. The variations are as diverse as blue lines or minor corrections, such as spelling. 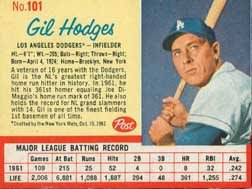 Presently, cards like the 1962 Post are getting a second look from collectors. You can amass the bulk of the set very quickly and cheaply if you are persistent. Since there are cards of Mickey Mantle (which is one of the variations), Sandy Koufax and Roberto Clemente (another variation), completing the set may prove costly, unless you find a real bargain. Sets like this are fun to collect and can enhance your collection instantly. One of the reasons for this blog was to showcase odd little cards, damaged cards and present mock up cards of subjects that you wouldn't normally see. For the mock up cards, Allen and Ginter cards present the perfect palette for creating these subjects. I had gotten away from that recently, but I have been inspired by two things to come back into creating these mock ups. 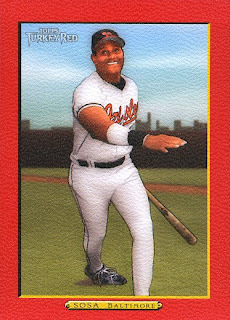 One was a post on this very blog showing a card of Sammy Sosa created by Capewood. The second was a reader's take on my first mock up card for this site, Jessica Simpson. On my White Sox blog, I have been creating a card per day of each person that has suited up and played for the team in 2008. That gets to be quite a list, with all the injuries, trades and other assorted mayhem of a typical season. I suppose for all these reasons and more, I have gotten the bug to create mock up cards again. This post's subject is Billy Goat. We all know who he is and we all know what he stands for. Supposedly, there is a number of curses placed on the Chicago Cubs. I think it's a bunch of malarkey, but some people really believe in that stuff. If they believe, they can have a card to print out and bow down to, destroy, worship, scream obscenities at or whatever they see fit. I wouldn't know what they do to appease the baseball gods, but here is the focus of their attention/obsession. 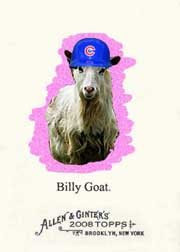 Don't think that I believe that all Cubs fans are goat cursing loonies. Far from it. Some of my best friends are Cubs fans and they are intelligent, rational human beings. There are a select few fanatics for each team, that tend to scare everybody else with their behavior. They shouldn't speak for every fan, but they tend to do so through the typical fanatical behavior. This card's for them to curse at. The rest of us can just appreciate the absurdity of it all. This is a scan of the actual Jessica Simpson card from the A&G set. I think we can all agree that it's quite patriotic. OK, OK, it's not a real card. It's a 3-minute Photoshop job by me, reusing most of the card in Steve's post. Tonight, I received a reader made mock up in my e-mail from Roger. Back in January 2008, in the very early days of this blog, I did a mock up of an Allen & Ginter Jessica Simpson card. This was a time where Jessica Simpson was considered a curse for showing up at games to support her boyfriend. She was labeled a distraction and blamed for losing the season. While that's debatable if that assumption was fair, I thought it was funny. Some fans take their sports waaaay too seriously sometimes. I do think that she was enough of a distraction that there wasn't enough attention paid to the task at hand. I think that she has unfairly taken the entire blame. So, here is Roger's take on Jessica Simpson using the Allen & Ginter 2008 logo. I think Roger did a great job! I'm happy that something I did could inspire someone to take the time to do their own take on it. Is it just me or is Jessica channeling a little bit of Hillary Swank in this photo? Yeah, it's probably just me. While researching for my latest post at Baseball Legends, I discovered that the subject of my post had a 1955 Bowman card. I thought that was unusual for a fairly new umpire to have a card in a baseball set. Then again, I would think that it would be odd for a seasoned umpire to have a card in a baseball set. I thought this was an odd set when it came out. I think it's an even odder set now. Since they have unified the umpires, the AL and NL hats are outdated. No longer will I hear about Al Clark being the only umpire with his name on his hat. The concept of this set is great. I can understand why a company would want to produce a set of this. Not only is it a way to honor the umpires of the game, but these cards humanize the "evil" umpires. You get to see that some are married, some have children. You know, the vital statistics. Although, I think the card manufacturers were inviting trouble by listing the city and state where each umpire resided. There are some crazy people out there who take wrong calls too seriously. The best part about these cards is the back. There's trivia on each card. You begin to understand that the people who do umpire, have to make difficult decisions everyday. Some of the scenarios are downright bizarre, some are common sense. Still, some feel like a word problem in math class. 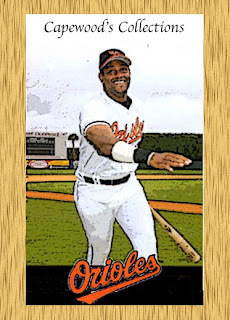 The one on the back of Al Clark's card is fairly easy, but there were a few where I was stumped a bit. Here's the one from the back of Al's card. Bases loaded, two outs, catcher drops 3rd strike. Can runners advance? Like I said, most are common sense questions, with a little twist. Think you know the answer? OK, here it is. Yes, the batter must be tagged or thrown out. Like I said, pretty common sense. This is more common after the 2005 ALCS where A.J. Pierzynski ran to first after a swing and a supposedly dropped ball. Now every batter seems to be running to first and every third strike seems to be thrown to first. I don't remember seeing that too often before 2005. I suppose that I am at an advantage. One of the main staples on my team's regular television broadcasts always let's the audience know about the umpires. So I grew up hearing about Al Clark, Rocky Roe, John Hirschbeck and many others. I'll always have these cards to remind me of when the umpires worked leagues exclusively, instead of umpiring both leagues. I'll always have a card of the only man that used to wear his name on his hat. I don't know too much about these things. I got 4 of them as a bonus in several Fairfield repack boxes a few years ago. Well, what is it? It is a little booklet with 30 pages. Each page is a sequential photo of the same play. When you flip the pages you get the see the whole play like a little movie. It's pretty low tech (we used to do this in high school with stick figures in the pages of paperbacks we had to read for English class). But also pretty effective. A scan of the front cover doesn't do it justice. If you flip from the front, you see the player batting. From the back you see a defensive play. I have two A-Rods, one Jeter and one Jim Thome. The Jeter and Rodriguez have the dates of the plays on the cover. The Thome doesn't but notes that the at bat was Thome's first home run as a Phillie. Sizewise, its as wide as a baseball card but about 3/8 of an inch longer. Its also a quarter inch thick. I've had them sitting on my desk since I got them because I don't know what to do with them. 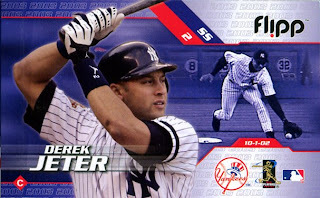 The Jeter card is currently on eBay at a Buy it Now price of $6.99. For awhile, the Fairfield boxes had these bonus objects. Most were not baseball cards but were baseball related. I'll post some more of them later. Or rather Cards of Steel. 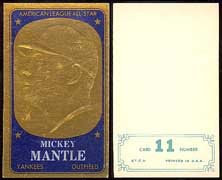 Baseball card manufacturers have been playing around with different materials sor many years. This trend starting picking up in the mid 1990s with cards made of plastic, wood, leather, metal, etc. coming on the scene. In 1996, Leaf put out a set called Leaf Preferred. The set wasn't very special but in every pack you got one of these. Leaf Preferred Steel. 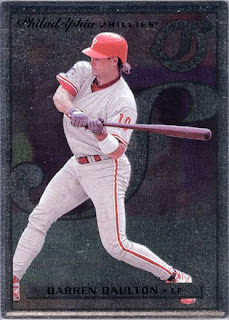 In addition to the Daulton, I also have Lenny Dykstra. Natch, both are Phillies. I don't remember how I acquired these. I only own one of the base cards. Most likely I got them at my local baseball card store who used to have a big box of reasonably priced singles. I say "used to" because he went out of business a few years ago and I no longer have a local card shop. Heavy sigh. The steel cards are pretty nice. They are solid cards with crimped edges. The printing is crisp. They look nothing like the base cards. In fact, they are much nicer looking than the base cards. They even had two parallels, Steel Gold and Steel Power. I've got a Gold card of Carlos Delgado. It looks just like the regular card except, of course, its Gold colored. I've never seen the Steel Power card. I purchased a half-box of 2008 Allen & Ginter at this year's National card show and behold how I reaped its rewards. Not only did it yield legendary HoFer King Arthur and amateur chess enthusiast Deep Blue, but there's the minor league rookie card of Pluto! Sweet! The shot even includes long-time--but unnamed--teammate Charon. Topps probably couldn't sign the latter planetoid to a contract in time to update the printing sheets and I smell another Maury Wills situation brewing. When Pluto's little buddy finally makes the big time, Upper Deck will give it a personal 10-card insert set with lunar dust relics. If your collection doesn't include at least one of the creatively chosen non-sport A&G cards this year, I recommend picking up something foreign and inscrutable to your man-on-the-street. Air guitar and arm wrestling champions earn a certain Redneck Windchimes esteem, but give me King Tut over blue collar Americana--no insult to fans of Provel or (my hometown favorite) squeaky cheese. Given the success of obvious must-haves like Pluto and Charon, I expect A&G to grow the mini-genre in future releases. They already matched state flags to born-there MLB players. How about pairing non-MLB cities with Vegas odds of the Nationals, Twins, Rangers, or Mud Hens moving there for bigger luxury boxes and a sweet cable TV contract? Hmm, I actually would go for a set of cards that linked MLB teams to their minor league affiliates. Or perhaps a list of sports agents and their wealthiest clients. Or repackaged feathers taken from an old-school golf ball used by Bobby Jones. Or a different card for each member of Molly Hatchet. Or I could stop with just the Pluto card. Awesome! A baseball card as a CD-ROM. 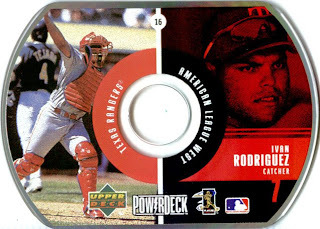 Upper Deck produced these in 1999 and 2000. An eternity ago in computer terms. The base set consisted of these cut down CDs. They were cut down so they would fit in a pack with normal sized baseball cards. There were a few insert sets. You got two of these in a pack along with 1 or 2 insert cards. I've always had a Macintosh at home and, even though it was supposed to be compatible with a Mac, I've always been afraid to put the thing into my CD-ROM drive. So I've never seen what's on the disk. If you're a computer geek, check out the minimum requirements for playing this disk: Pentium processor-based PC. 133 MHz, 12 MB of available RAM, Windows 95/98 or NT 4.0. QuickTime 3.0 extension for Windows (included), 16-bit color display monitor (required). Sound Blaster card, 4X or faster CD-ROM drive. In those days, a computer like that just screamed with power. With Topps 2008 Allen & Ginter finally available in retail, I thought I'd pose a question. Maybe every other baseball card collector already knows the answer but it's not something I'd seen discussed before. My question is, are the pictures on these cards paintings (perhaps, and probably made from photographs) or are they Photoshopped photographs? 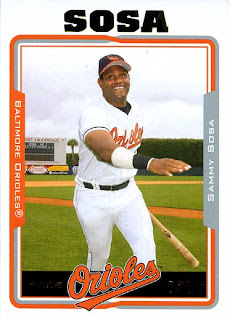 To the left is a 2005 Topps Update card featuring Sammy Sosa after he came back to baseball briefly with the Orioles. The second card is from the 2005 Topps Turkey Red set. It looks pretty clear to me that the Turkey Red card was produced using the same photo as the Topps Update card. So how did they do this? My guess is that Photoshop (or something like it) was used. I'm sure that a set of customized filters could be set up to make the transformation. There were only a few different backgrounds for these cards. The filters would do all the work. It would probably take just minutes per card. I don't think I have a problem if Photoshop is used. I'm guessing if the Allen & Ginter Company had something like that in the 1880's they'd have used it instead of hand painting each card. Finally, my feeble attempt to produce a card using Photoshop Elements. I obviously started with the Topps Update card. The card designers of Topps and Upper Deck have nothing to worry about from me. Or at least that's what the eBay listing said. The top swatch is actually from a game-used stirrup. That's not the same as a sock but it's worn on the same part of the anatomy. Like the 2004 Donruss Diamond Kings I posted a few days ago, this is another set which is full of inserts. There were 209 inserts with this set. There were 89 cards in the base set and 4,345 different insert cards. All of the insert cards had either an autograph, a relic, or both. Many cards have more than one relic, some have as many as 4. All were serial numbered. I never saw a pack of these cards in the wild. According to Beckett, there were 2 inserts per pack, so I'm guessing the packs were expensive. They cards are not hard to find on eBay and some of them are reasonably priced. 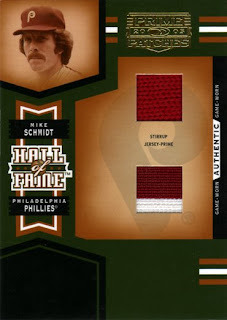 I paid $14.32 for this Schmidt card. I probably wouldn't spend so much for any other player. In recent weeks I've managed to buy 6 cards from this set: J. D. Drew Prime Patches Major League Materials Triple Swatch (actually I got this a year ago, the card has a bat, a jersey and a shoe); Tony Gwynn Prime Patches Portraits Jumbo Swatch (this card has about the largest jersey patch I've ever seen, it's more than half the card); Jim Thome Prime Patches Portraits Team Logo Patch (bonus, he's a Phillie on this card); Moises Alou Prime Patches Portraits Triple Patch (bonus, he's an Astro on this card even though he left the Astros in 2001. It has 2 jersey pieces and a bat), Jeromy Burnitz Prime Patches Portraits Quad Swatch Prime (it has 4 jersey patches, 2 white, 1 black and one gray with a piece of patch on it). I paid less than $6 a piece for these (not counting the Schmidt). Not bad considering that two of them are surefire future Hall of Famers. You can see my whole collection of these here. The mice are hungry and they'll eat your precious investments if you don't watch out. Mr. Bailey even seems aware of the creeping horror that lies in wait behind the kitchen walls. Don't turn off the lights, he pleads mutely. I can hear their silent, furry breathing. As the rodentia can tell you, E90 cards like this one come in three flavors: ketchupy E90-1 (Pittsburgh players), deep-dish E90-2 (Chicago players), and "kitchen sink" E90-3 (all MLB players). Being a STL hurler, Bill Bailey is from the last group, whose full set numbers 118 cards. Also known as American Caramels, the set runs big money, even for low-grade commons. Expect to pay hundreds for the pleasure of owning an actual star. Speaking of money, one of the booths from this year's National card show hawked insurance for your collectibles. Given the myriad of things that can happen to paper, I wonder how they'd react to claims of bug infestation or rodent damage. Back in my Nintendo-working years, the service department would occasionally receive non-functional game systems full of mouse poop. Or a roach nest. Or silverfish. In a word, ugh. At least the modern grading slabs and plastic pages keep local fauna at bay so the insured can sleep somewhat better. These cards were inserted into packs in 1965. Topps foil lust goes back farther than any of us ever imagined. The set consists of 72 cards. Many stars of the day are included in the set. Mickey Mantle, Willie Mays, Ed Mathews, Moose Skowron, Zolio Versailles and many others grace this set. Considered an oddball insert set, these cards can be a cheap and effective way to collect vintage cards of Hall of Fame players and 1960s stars. These cards literally litter eBay with their presence. They won't stand out on their own, but if you do a quick search, they will pop up. 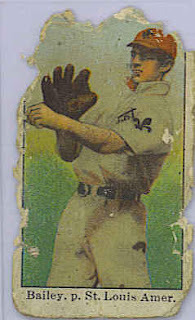 The cards themselves measured 2 1/8 by 3 1/2 inches. American League players were framed in blue and National League players had red. The gold foil was standard, but there have been reports of silver foil cards lurking about. And you thought that foil cards started in the nineties! This is something special I whipped up on my own. 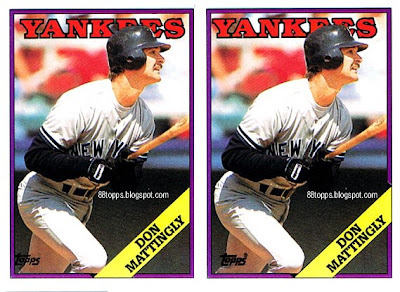 This is a three-dimensional stereogram, meaning that if you blur your eyes and fuse the two Mattingly cards into one, you can see some 3D effects. I put the "Yankees" name far into the back, the Mattingly name banner and Topps logo into the foreground, and made a few other little changes. If you focus on the purple border to the card, get that solid, you should easily be able to see these other changes.